97 points - Last tasted on February 14, 2006 - Tasting notes here. The Bowmore distillery on Islay was built in 1779, at least that's the claim made by their marketeers. 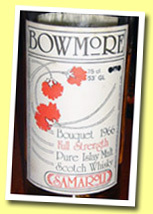 This would make Bowmore one of the oldest working distilleries in Scotland. However, the records from this early period are often relatively vague, so when the first Bowmore was actually distilled is hard to determine with 100% accuracy.... More on Malt Madness.